In my work at Cranbrook, I conduct many, many tours of the campus. My favorite are those conducted for students of architecture. Often, the students aren’t here to simply see the buildings or hear the history, but are visiting to compliment a specific course. Just this past Tuesday I led students from Michigan enrolled in a course on architectural ornament on a two-hour tour of Saarinen’s ornament for Cranbrook—this after a ten-day trip to London and Paris to study the same! Another common purpose for a Cranbrook field trip: to use our campus as a site for a design studio project. As a former architecture student, I know these tours have an even more urgent purpose. The instructor creates a project brief for a building, with a client, site, purpose, and never a budget; the student then spends the semester designing and detailing their proposal. Recently, architecture students from Bowling Green came to campus on a site visit for their final studio project: propose an expansion of the Academy of Art Library. Aerial view of Cranbrook Academy of Art Museum (left), Peristyle (center), Library (right), and painting studios (far right). Photographed by Harvy Croze during the County Fair, June 1958. Copyright Cranbrook Archives. We had an instructive conversation with librarian (and client) Judy Dyki, followed by a tour of the building’s main reading room, lower level and storage areas, and down further into de Salle auditorium. The students are now tasked with coming up with an addition to the Library for their final project. If an addition to Saarinen’s library seems sacrilegious, it shouldn’t. Saarinen himself envisioned the museum and library as parts of a larger whole, a quadrangle made up of housing, a dining hall, and the museum and library, all around the Orpheus Fountain. Cranbrook Academy of Art: Proposed Dining Hall and Dormitory, North of Museum and Library. Site Plan (south is to the top of the page). Eliel Saarinen, architect. September 1945. Graphite on tracing paper, 25 x 38 5/8 in. Collection of Cranbrook Art Museum. Saarinen began work on the design for the museum and library in 1939. It was the last major collaboration of George Booth and Saarinen on the campus, and the most monumental. The buildings opened in 1942, and the aesthetic and functional successes of the museum and library have been written about elsewhere (and are everywhere evident on a visit). What’s less known is that Saarinen thought the project was incomplete. 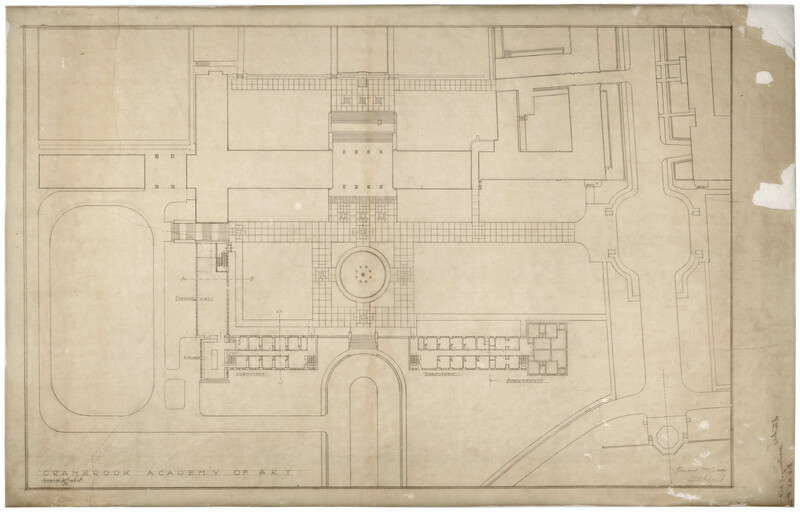 In a drawing from September 1945, Saarinen shows his proposal for completing the Academy of Art’s campus: an L-shaped addition with a dining hall and kitchen on the east side and dormitories and apartments crossing in front of the Orpheus Fountain toward Academy Way. Also notice the additional building, likely for the Art Museum, further east and linked to the main building by columns similar to those at the Peristyle. Cranbrook Academy of Art Museum and Library (extant) in navy. Proposed addition, possibly for the museum, in royal blue. Proposed dining hall in orange, proposed dormitories in dark red, and proposed apartments in light red. Orpheus Fountain at center. 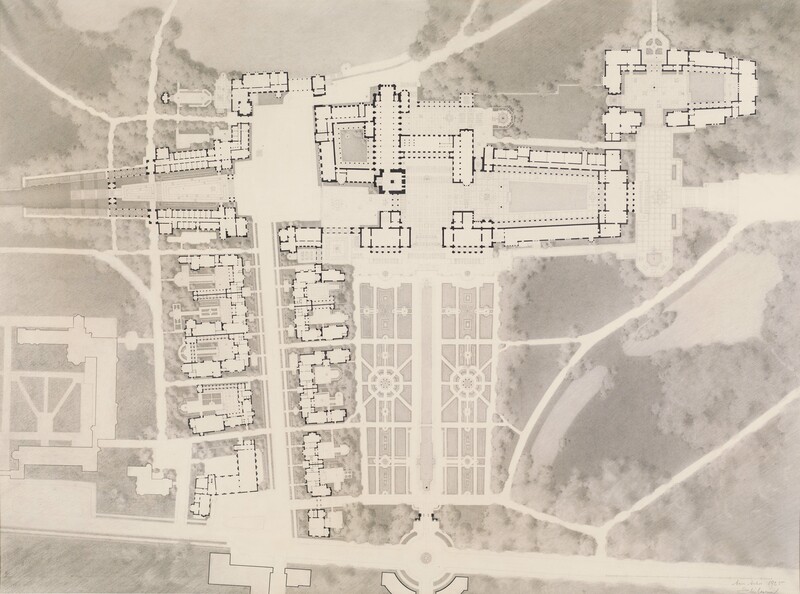 If you look at the rest of the Cranbrook campus, his impulse to hem in the museum and library further makes sense: Saarinen’s buildings are always arranged into quadrangles or terraces. His buildings enclose and frame outdoor space, far more than they sit singularly in the landscape. As built, the museum is unique in that it sticks out as a bar (or, more specifically, a T) away from Academy Way. Though strongly anchored to its site through landscape, fountains, and sculpture, it does not create a courtyard (as he proposed) so much as it forms a wall or monumental gate. 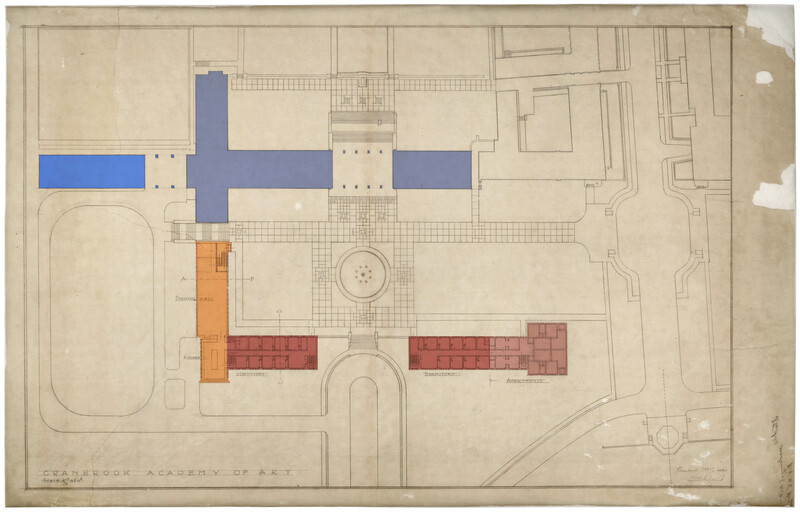 If we look back at Saarinen’s first (and very large) proposal for the Academy of Art, you’ll notice it too is made up exclusively of buildings that form interlocking courtyards and terraces. This design language continued the site planning he executed at the Boy’s School and anticipates the careful interweaving of landscape, building, and stepped terraces seen at Kingswood. Cranbrook Academy of Art: Proposed plan. Eliel Saarinen, architect. 1925. Pencil and ink on paper, 29 x 39 in. Collection of Cranbrook Art Museum. Eventually, of course, the museum and library building did receive additions. The first, DeSalle Auditorium by Robert Saarinen Swanson, was underground. The New Studios building by Rafael Moneo extended the building to the east, but further south than Saarinen proposed. Finally, the 2011 Collections Wing by SmithGroup JJR, maintains a remarkable closeness to the scale and placement of Saarinen’s proposed dining hall. By maintaining the same height and narrowing in width to the north, the very large structure respects the scale of the 1942 buildings. 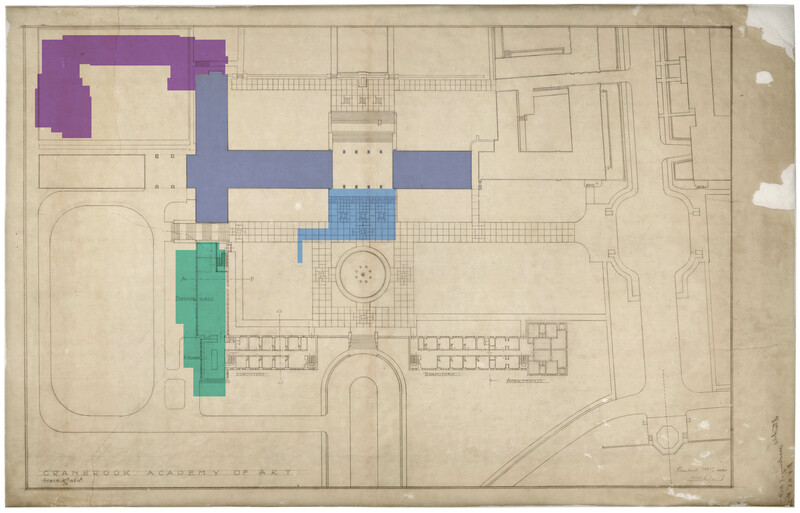 Overlay of built additions to Cranbrook Academy of Art Museum and Library, showing the underground DeSalle Auditorium (1986) in royal blue; the New Studios building (2002) in purple; and the Collections Wing (2011) in green. 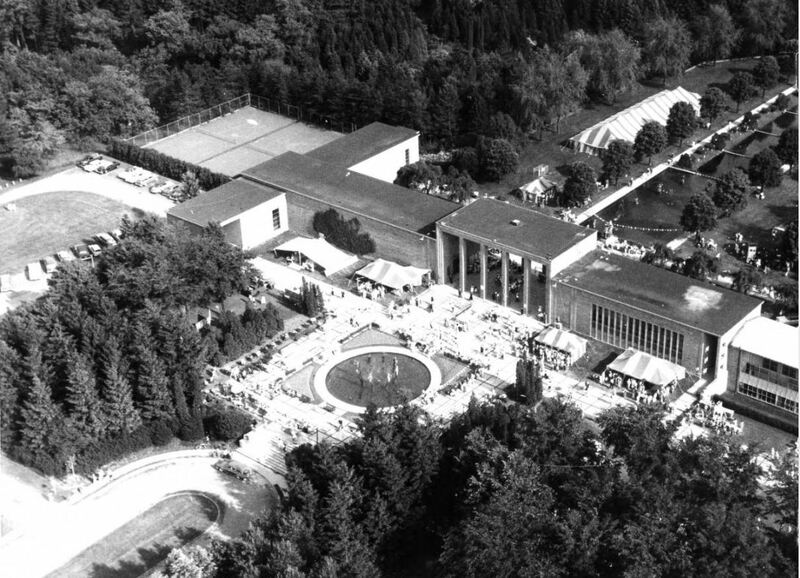 That Saarinen’s particular vision for the Academy remains incomplete is part of what has become a long tradition of unrealized dreams at Cranbrook. What I find exciting is simply the ability to dream, to propose new buildings interacting with the old, and engage with what Robert A. M. Stern calls architecture’s ability to hold conversations across time. While the students for Bowling Green will propose a structure to be placed on what has become sacred ground (and, I imagine, in styles so bombastic or incongruous that I shudder to picture them), the project itself is a rich one. It is exciting, in the pressure cooker of architecture school, to interact on paper or screen with truly great buildings. What I love about taking design students on tours of Cranbrook is analyzing how Saarinen achieved what he did with his buildings. Not just observing that he designed a beautiful, evocative, and functional Arcadia, but how, in truly tectonic ways, he did it. We study how bricks are laid, the way stairs are detailed, and how Saarinen aligned (or didn’t align) view sheds and sculptures to create the larger whole. We look closely and analytically. My hope in studying the buildings from an assembly standpoint, and not just historically, is that students can take these lessons into their projects and into their practice. Surely if architects take a few more lessons from Saarinen, the world will be a better and more beautiful place. Interestingly the Natatorium does complete the corner established by the addition to the museum, albeit far away. Kevin I loved this writing ! I learned a lot I didn’t know and particularly was touched by your musings and philosophy and how the buildings and their architects are still teaching. Thank you!